A close-up look of PNNL's concentrating solar power system for natural gas power plants. 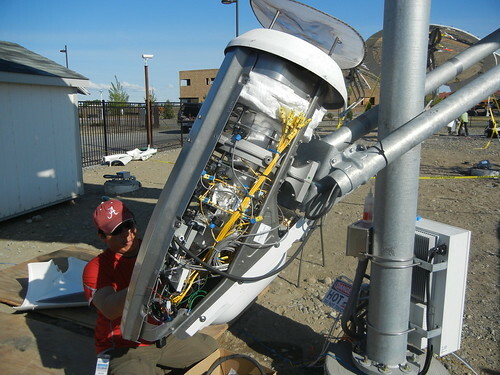 PNNL's thermochemical conversion device is installed in front of a concentrating solar power dish. The device converts natural gas into the more energy-rich fuel syngas, which power plants can burn to use less fuel and reduce greenhouse gas emissions. 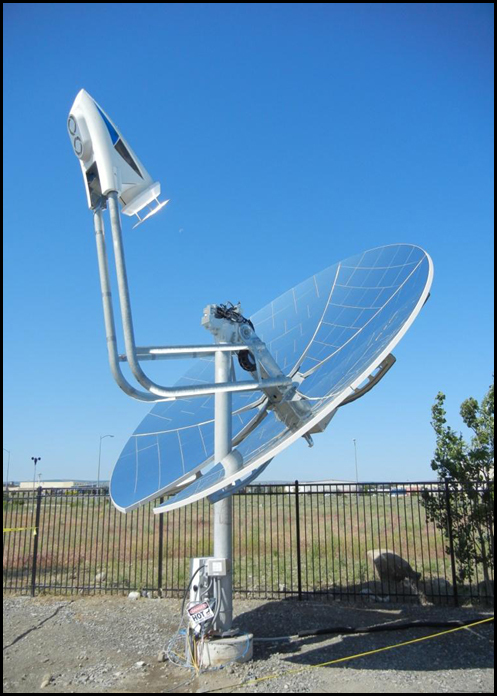 PNNL's concentrating solar power system for natural gas power plants, installed on a mirrored parabolic dish. Download high-resolution image via Flickr. RICHLAND, Wash. — Natural gas power plants can use about 20 percent less fuel when the sun is shining by injecting solar energy into natural gas with a new system being developed by the Department of Energy's Pacific Northwest National Laboratory. The system converts natural gas and sunlight into a more energy-rich fuel called syngas, which power plants can burn to make electricity. "Our system will enable power plants to use less natural gas to produce the same amount of electricity they already make," said PNNL engineer Bob Wegeng, who is leading the project. "At the same time, the system lowers a power plant's greenhouse gas emissions at a cost that's competitive with traditional fossil fuel power." With the U.S. increasingly relying on inexpensive natural gas for energy, this system can reduce the carbon footprint of power generation. DOE's Energy Information Administration estimates natural gas will make up 27 percent of the nation's electricity by 2020. Wegeng noted PNNL's system is best suited for power plants located in sunshine-drenched areas such as the American Southwest. Installing PNNL's system in front of natural gas power plants turns them into hybrid solar-gas power plants. The system uses solar heat to convert natural gas into syngas, a fuel containing hydrogen and carbon monoxide. Because syngas has a higher energy content, a power plant equipped with the system can consume about 20 percent less natural gas while producing the same amount of electricity. 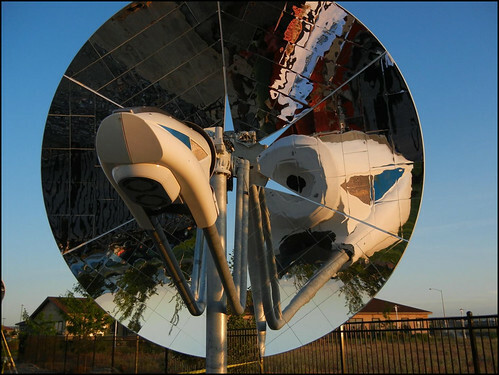 This decreased fuel usage is made possible with concentrating solar power, which uses a reflecting surface to concentrate the sun's rays like a magnifying glass. PNNL's system uses a mirrored parabolic dish to direct sunbeams to a central point, where a PNNL-developed device absorbs the solar heat to make syngas. About four feet long and two feet wide, the device contains a chemical reactor and several heat exchangers. The reactor has narrow channels that are as wide as six dimes stacked on top of each other. Concentrated sunlight heats up the natural gas flowing through the reactor's channels, which hold a catalyst that helps turn natural gas into syngas. The heat exchanger features narrower channels that are a couple times thicker than a strand of human hair. The exchanger's channels help recycle heat left over from the chemical reaction gas. By reusing the heat, solar energy is used more efficiently to convert natural gas into syngas. Tests on an earlier prototype of the device showed more than 60 percent of the solar energy that hit the system's mirrored dish was converted into chemical energy contained in the syngas. Wegeng's team aims to keep the system's overall cost low enough so that the electricity produced by a natural gas power plant equipped with the system would cost no more than 6 cents per kilowatt-hour by 2020. Such a price tag would make hybrid solar-gas power plants competitive with conventional, fossil fuel-burning power plants while also reducing greenhouse gas emissions. The system is adaptable to a large range of natural gas power plant sizes. The number of PNNL devices needed depends on a particular power plant's size. For example, a 500 MW plant would need roughly 3,000 dishes equipped with PNNL's device. Unlike many other solar technologies, PNNL's system doesn't require power plants to cease operations when the sun sets or clouds cover the sky. Power plants can bypass the system and burn natural gas directly. Though outside the scope of the current project, Wegeng also envisions a day when PNNL's solar-driven system could be used to create transportation fuels. Syngas can also be used to make synthetic crude oil, which can be refined into diesel and gasoline than runs our cars. The current project is receiving about $4.3 million combined from DOE's SunShot Initiative, which aims to advance American-made solar technologies, and industrial partner SolarThermoChemical LLC of Santa Maria, Calif. SolarThermoChemcial has a Cooperative Research and Development Agreement for the project and plans to manufacture and sell the system after the project ends. More information about PNNL's concentrating solar power system for natural gas power plants. REFERENCE: RS Wegeng, DR Palo, RA Dagle, PH Humble, JA Lizarazo-Adarme, SK, SD Leith, CJ Pestak, S Qiu, B Boler, J Modrell, G McFadden, "Development and Demonstration of a Prototype Solar Methane Reforming System for Thermochemical Energy Storage — Including Preliminary Shakedown Testing Results," 9th Annual International Energy Conversion Engineering Conference, July-August 2011, http://arc.aiaa.org/doi/abs/10.2514/6.2011-5899.